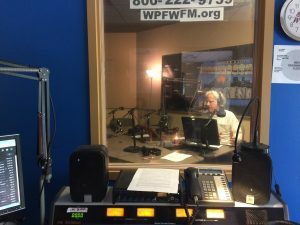 Jeremy Alderson in WPFW Studios. As covered in our previous article, Extreme Poverty and Homelessness: 20th Anniversary of the Homelessness Marathon, this year marked the 20th anniversary of the homelessness marathon. For more information about the homeless and what is being done to help them visit National Coalition for the Homeless and/or Poor People’s Economic Human Rights Campaign, you can also visit Homeless Marathon‘s website. This entry was posted in News by Olivia Brinkmeyer. Bookmark the permalink. programming to provide leadership and vision to growing station. Click here for more information. Pacifica’s tradition of unhampered access to the airwaves has allowed our network to play a uniquely focal role in American media. We have broken pivotal news stories and brought issues and artists to the spotlight that may have been overlooked. We broadcast via satellite and Internet and have one of the most extensive and important sound archives in the world. With a network of approximately 200 affiliate stations, we are energizing independent community radio through collaboration, interactivity and program exchange throughout the network. Pacifica Foundation established the concept of community radio in the United States when it created KPFA in 1949 in Berkeley, California. Today, Pacifica owns WBAI in New York City, WPFW in Washington DC, KPFT in Houston Texas, KPFK in Los Angeles, and KPFA in the San Francisco Bay Area. Copyright © 2019 Pacifica Network. All Rights Reserved. Enter your scrollbar width in pixel, default is 10 (pixel). Enter your scrollbar height in pixel, default is 70 (pixel). Enter scrollbar border width. Default is 0 (pixel). Change your scrollbar border color. Default is #1e1f23. Enter your scrollbar border radius in pixel. Default is 5px. Enter your scrolling speed, default value is 60. Increase value make scrollbar speed slower & decrease value make scrollbar speed faster.